Please bereminded that due to light effects and monitor's brightness/ contrast setting ect, the color tone of the website's photo and the actual item could beslightly different. MATERIAL: The handmade Curved iron style, hand-wound cotton, each wall lamp has a different pattern, 3W, 110V. SIZE: 36x27cm, wall, desk, any corner of life; be your warm night light, accompany you every night and early morning. 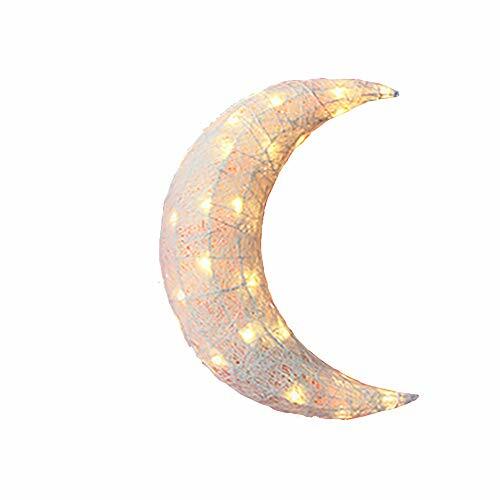 PERFECT GIFT:Romantic Lighting Best Christmas/New Year Gift Creative Crescent Moon.Beautiful Decorative Desk Reading Lamp. If you have any questions about this product by LgoodL, contact us by completing and submitting the form below. If you are looking for a specif part number, please include it with your message.